Don’t let the snow fool you, it really is officially Spring. After the winter we’ve had we’re sure no one will be complaining as the grass starts getting greener and the sun starts shining a little brighter. Who might be more excited than anyone? Ticks! It’s true. Ticks have been hanging around all winter just waiting for warm days to rear their very ugly little heads and jump on a warm body. The biggest concern we have at Mendon Village Animal Hospital when it comes to ticks is Lyme Disease. Lyme disease is caused by a bacteria that is transmitted into the bloodstream by infected deer ticks. Symptoms may be difficult to detect and may come and go. The most common symptoms we see are lameness, lethargy and decreased appetite. In the worst case scenario, Lyme disease can cause kidney failure and even result in death. This disease does not only affect dogs. As you probably know, people can get Lyme disease too. How do we test for Lyme Disease in dogs? You’ve probably heard us recommend a “Heartworm/Lyme” test when your dog is here for his or her annual preventative care exam. This is a little nickname we’ve given the test, that doesn’t quite do justice to what the test can actually do. With only three drops of blood this test can detect the presence of antibodies to Heartworm, Lyme disease, and two other tick-borne diseases (Anaplasmosis and Ehrlichiosis). That’s a fancy way of saying that with a tiny blood sample, we can see if your dog has ever been exposed to the bacteria that causes Lyme Disease! We are seeing a steady increase in the number of dogs who test positive for Lyme disease here at MVAH. In 2013, 1 in 16 dogs tested positive. Last year that number increased to 1 in 10 dogs. Since January of this year, we’ve had 37 positive tests. What dogs are most at risk for Lyme Disease? The answer to this one might surprise you! In years past, we saw Lyme disease most often in larger dogs who spent time in woods or fields. These days, few dogs are isolated from the risk of coming in contact with ticks. At Mendon Village Animal Hospital, we see Lyme positive tests on everyone from toy Poodles to Great Danes. We can say with conviction that most of our patients are at risk. Consider your surroundings and your pet’s lifestyle. Are there deer or other wildlife around? Do other dogs occasionally make their way into your yard? Where do you take your dogs for walks? Many parks in our area are hot spots for ticks. Do your dogs travel with you? The Companion Animal Parasite Council is constantly collecting data on Lyme Positive dogs across the country. Check out their prevalence maps to see how common Lyme disease is in your county. How can you help protect your dogs? Protecting your dogs and your family from Lyme Disease requires a multi-faceted approach. 1. Check for ticks daily! Think of this as fun bonding time. Give your dog a good full body scratch. Don’t forget to check behind the ears and between the toes! Ticks will attach anywhere. 2. Remove ticks ASAP. 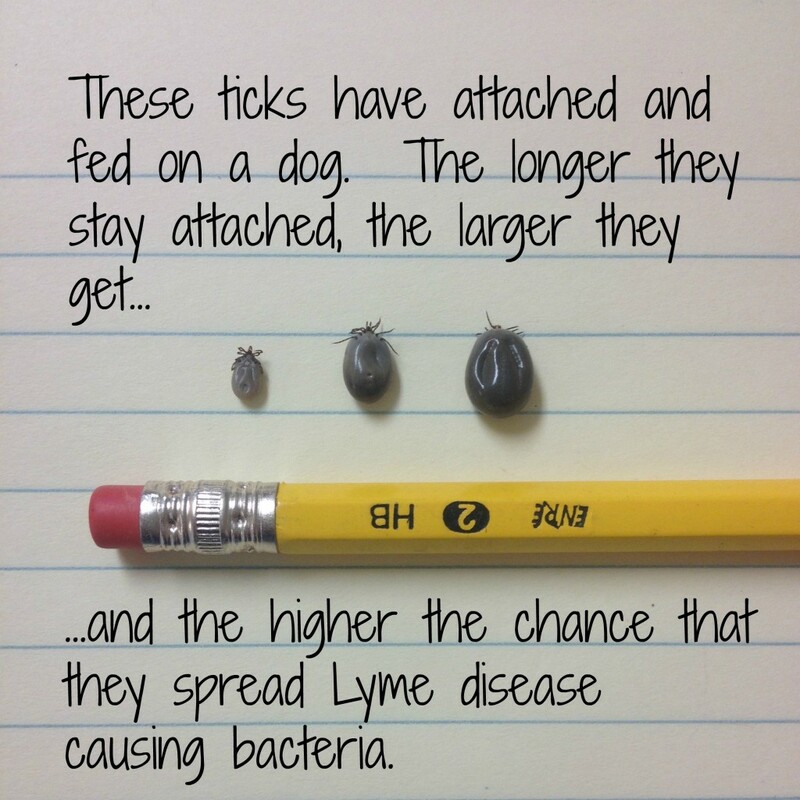 The longer a tick stays attached to your dog, the more disease causing bacteria gets transmitted into the bloodstream. Don’t pay attention to any old wives tails when it comes to tick removal. Our tried and true method is either a pair of tweezers or a tick removal tool. We love Tick Twisters! The benefit of using a tool like the Tick Twister is the entire tick is removed easily, and no pressure is put on the tick itself, which can squeeze more bacteria into your dog’s bloodstream. The technicians here at Mendon Village Animal Hospital are always happy to help you remove ticks, and teach you how to do it at home! 3. Use a preventative that works! Our top recommendations are Parastar Plus and the Seresto Collar. Both of these products help protect your dog against ticks and fleas. They can even be used together for better protection. Parastar Plus is a topical preventative that kills ticks for 30 days. It is waterproof, but we recommend not bathing or letting your dog swim for 48 hours before or after it’s applied. The Seresto Collar lasts for 8 months. It is water proof, and can both kill and repel ticks. The great thing about the Seresto collar is that you don’t have to remember to apply a topical product each month. 4. Consider vaccinating your dogs against Lyme Disease. We recommend the Lyme vaccine for any of our “at risk” patients. Talk with our veterinarians at your next visit to see if the Lyme vaccine is right for your dog. 5. Test for Lyme Disease regularly. We recommend the “Heartworm/Lyme” test we mentioned on a yearly basis. Why is it so important to test for Lyme Disease even if your dog is vaccinated and/or you are using a preventative? Unfortunately, no vaccine OR preventative product is 100% effective. If caught early, Lyme Disease can be easily managed with antibiotics. 6. Check out www.dogsandticks.com for more information on checking for and removing ticks, and for tips on how to reduce the risk around your home.